The high quality of exposures and fossil content in the Mesozoic rocks of the Neuquén Basin are strong interesting for the basin development research and hydrocarbon exploration. 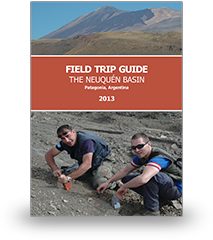 The trip covers the main localities and landscapes of both Jurassic and Cretaceous outcrops from the Neuquén Basin as well as the Cenozoic volcanic complexes around the Tromen volcano. The quality of outcrops, good roads, and excellent infrasturcture in the field areas make exciting place to visit for the geoscientists from all over the world. Field trips can be specially organised on individual company request.